We understand that each Council is different, so there are a range of 30 pollinator-friendly actions to choose from. 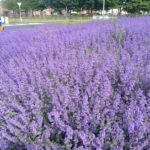 There are instructions for each action, suggestions for where it might be applied, what staff could assist, and a pollinator-friendly planting code. Suitable for: ROI: County and City Council staff. NI: Borough, District and City Councils. 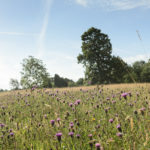 Most Councils/ Local Authorities are already taking actions to support pollinators on public land. Many are also working with local community groups, residents’ associations and schools to help raise awareness of the All-Ireland Pollinator Plan. 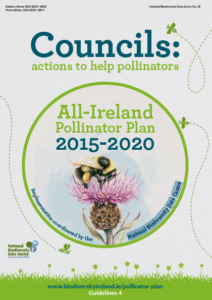 To better support these efforts and to better promote the work being undertaken, we have developed this framework to recognise Councils as partners of the All-Ireland Pollinator Plan. Partnership with an internationally renowned strategy to reverse declines in biodiversity. A framework outlining options with the flexibility to choose from a variety of low/cost-neutral evidence-based actions that will have a positive impact. Helps demonstrate compliance with statutory requirements such as the Council’s Biodiversity statutory responsibilities. 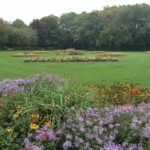 A demonstration of your biodiversity credentials to local residents who are increasingly concerned with supporting environmentally friendly initiatives. Actions to support community engagement and strengthen relationships with local groups who are also working to protect our pollinators, e.g. Tidy Towns groups, Ulster in Bloom. Put your pollinator-friendly sites on the map! Has your Council taken any pollinator-friendly actions? If so, have a staff member log them on our online mapping system, Actions for Pollinators, to get the credit you deserve! Help us track the build-up of food and shelter in our landscape (Instructions for logging a Council site). Please visit our Resources page to find presentations, posters, How-to-guides, and signage templates. 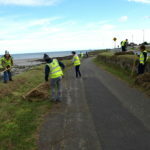 We have lots of other resources for Local Community groups, such as Tidy Towns groups, and schools. Sincere thanks to Bernadette Guest, Heritage Officer with Waterford City & County Council, and Filmmaker Peter Cutler from CrowCragProductions.com for making the video above about how Councils can protect Pollinators. This video was funded through the Creative Ireland Initiative. Thanks to our partners at Wexford County Council, Belfast City Council and the NIEA for collaborating with us on these Council Guidelines.